The 6th annual Southern Oregon Arts and Research conference is fast approaching, providing an opportunity for Southern Oregon University students and faculty to show off the work they’ve been doing over the past year. Opening ceremonies between 12:30 to 1 p.m. Lab and studio open houses from 1 to 5 p.m. around campus. The student film festival from 7 to 9 p.m. in the Varsity Theater at 166 E. Main St. Presentations, performances and exhibitions between 9:30 a.m. and 4:30 p.m. Presentations, performances and exhibitions between 9:30 and 11:30 a.m. and 1:30 to 3:30 p.m.
Poster sessions from noon to 1:30 p.m. Awards ceremonies from 4 to 5 p.m. SOAR reception and SOU author recognition between 5 and 7 p.m.
Music recitals from 12:30 to 1:30 p.m.
Theater on the Green between 2 and 4 p.m. The event locations will be announced in the coming weeks. For a complete schedule pick up a pamphlet at the SOAR headquarters in the Stevenson Union or from the Hannon Library Circulation Desk. You can also visit sou.edu/soar for more information. 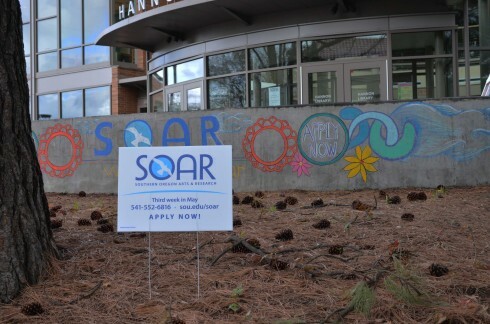 Paul Adalian, dean of the library, feels that SOAR helps students gain confidence in their abilities, a strength that comes in handy in situations such as applying to graduate school or looking for future employment opportunities. “It’s a great way for students to communicate and present research in a friendly environment,” he said. Adalian has been an organizer of the event for the past five years, and has seen countless examples of the talent SOU’s students and faculty bring to the table. Last year saw 680 participants, and this year the organizers are hoping for even more involvement. It’s a great “way to showcase your work, regardless of major,” said Adalian. Greg Pleva, associate professor and chair of the computer science department, participated in SOAR last year, speaking about 3-D images and how they process in the brain. According to Pleva, his interest in the subject sprouted a long time ago, and he has been giving presentations on his research across the country ever since. Pleva entered his research into SOAR with the hopes of sharing his knowledge with the students of SOU. This year Pleva will be hosting a demonstration on the subject of 3-D printing, a fascinating process that creates 3-dimensional objects from digital images. According to Pleva, the 3-D printer is cutting edge technology, and he will be demonstrating how this process works. He predicts that this will take place in one of the rooms in the basement of the Stevenson Union. Abbigail Rosewood will be graduating from SOU this spring with a degree in English. She presented at SOAR last year with one of a set of four short stories for her capstone project. According to Rosewood, all of the short stories were set in Vietnam, where she was born and raised before moving to the U.S. Rosewood said her favorite part about the SOAR experience was having her stories received by a live audience. Samantha Nixon, a sophomore majoring in environmental studies, used SOAR to gain publicity on the Oregon Student Public Interest Research Group or OSPIRG’s Protect our Oceans campaign. In order to educate people on the harmful effect of plastic bags in the environment, Nixon and a friend read a poem and dressed up in capes made out of plastic bags. Nixon said that her participation in SOAR taught her some techniques for public speaking and the importance of educating people through creative techniques. Applications for SOAR are due by Friday, April 19 and posters must be submitted by Friday, May 3. For more information or to apply for SOAR 2013, go to sou.edu/soar.